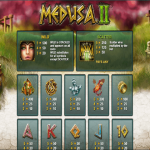 Medusa II is a new and improved version of an already existing game from NextGen Gaming. 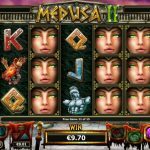 If you ever wondered what it would be like to come face to face with Medusa, well now you have the chance. Just be careful and avoid eye contact. After all you want to enjoy the fruits of your game play when it is over. There are a couple of features that make Medusa II an interesting game. first we have the Medusa’s Locked reels where two, three, four or five of the reels can lock and display the same symbols. 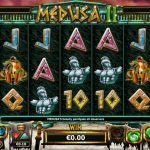 The main feature is the free spins feature and it is activated by landing 3 or more scatter symbols. The good news here is that the Locked Reels can appear here as well, and even better is that they appear more often than in the base game. And the last, but not the least is the Turned to Stone Stacked Wilds. This is where the soldier tries to attack Medusa and she turns him to stone and turn the reel he was on into a wild. Medusa II is a masterpiece from NextGen Gaming. The game play is engaging and everything we see in front of us is so pleasing and engaging. The game is slightly different than the original version, so you can try them both and see which one you prefer. We enjoyed playing this game and especially we liked the fact that the features are so easy to activate. The betting options are also worth mentioning since they are created in that way to suit every roller’s need. So no matter if you are a high roller or low roller you will find the bet size that is good for you. For another great engaging game you should consider playing Maid o Money a 5 reel slot by NextGen.